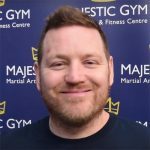 Beginners will learn how to stand, how to position your hands and feet, defend and strike using punches, kicks, knees and elbows; while those more advanced people will be pushed using a greater repertoire of Muay Thai techniques. Always under the coach’s watchful eye, you hit bags, work on pads, spar and clinch (knee sparring). The mixed class is as demanding as you like depending on how hard you work and eventually you will be stronger, leaner, and fitter and be ready to move into the advanced classes. © Majestic Gym - Martial Arts & Fitness Centre 2017. All Rights Reserved.